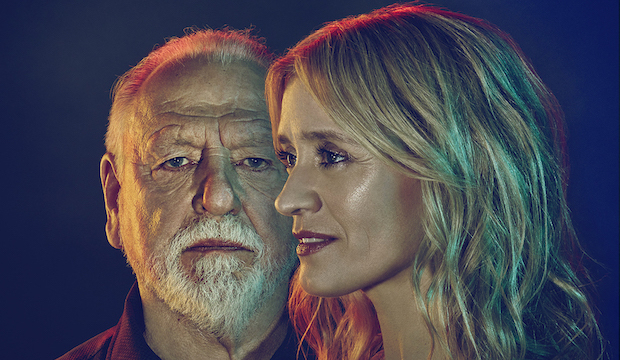 The play follows the unexpected relationship between two strangers, played by Kenneth Cranham and Anne Marie Duff. The character’s willingness to embrace something unusual, something they weren’t counting on is a key theme of the play and the pair end up becoming embedded in each other’s lives. Simon and Marianne hit upon an international success with his adaptation, directed by Marianne, of the best-selling novel, The Curious Incident of the Dog in the Night-Time. It took Broadway and London by storm, earning the production a number of Tony and Olivier awards and years later, the two are still able to find themselves in creative synchronicity with each other. Having worked with each other several times now, Simon and Marianne appear to have a deep and complementary relationship: his boundless creative energy balances nicely with Marianne’s thoughtful, philosophical yet practical approach. Unknowingly, the pair have actually been in each other’s lives since their teen years, discovering recently that they got on the same bus to school. Their careers now, despite missing each other as teenagers, seem inextricably linked. Marianne will be directing Heisenberg but is also part of the production company behind it. She had spent 10 years at the National Theatre with Producer Chris Harper, working on incredible shows like War Horse, and now they’re breaking ground on their new theatre production company, Elliott and Harper. Chris commented on the relationship between all three of them. “Marianne and I decided to leave the National Theatre about a year ago and set up our own company. It was a really exciting opportunity for us to be in charge of our own productions and make the decisions of what shows it is we might want to do and how we might do them. Simons Stephens, Marianne Elliott and Chris Harper share a joke post-interview. It was really clear to us that we, having had such a success with Curious Incident, which Marianne directed – without any hesitation we must do a play by Simon Stevens. Chris went on to introduce Marianne and Simon, who came together for a lively chat about their relationship, the play and the joy of the unexpected. On his writing process, Simon said, “Ordinarily, I’m a ferocious planner, I plan plays really carefully and with this one I wanted to do something really different. I wanted to try and release the instinctive, to release the unpredictable, to write in a way I’ve not written before. When discussing the nature of his work, Marianne describes Simon’s characters as being full of sadness and who are looking for ways to move on from that feeling, Simon responds that maybe his characters are optimistic because they face their problems. You can see Heisenberg: The Uncertainty Principle in London when it opens at the Wyndham’s Theatre on 3rd October. Want more? The Monster Speaks! An Interview With Young Frankenstein’s Shuler Hensley.